I am a speech path on Div 16-I also “like” your page on Facebook. I work in the public schools and plan on buying an ipad soon. I saw your review of the otter cover; I have seen them for iPhones. I like them. I know I am going to buy one before I buy my iPad. I tend to be hard on iPads. Now for the advice: I am currently doing projects to get “free” items for my classroom. I am going to write 1 or 2 projects for items for the ipad. 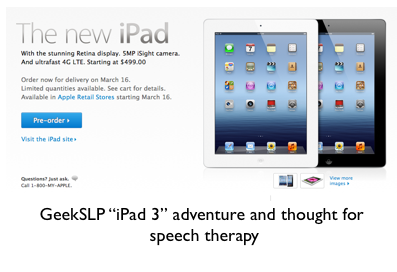 I would like to know what speech therapy apps you would recommend-including yours for therapy. 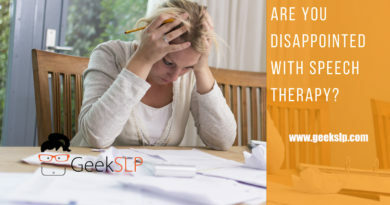 Also what apps would help me in my job as an slp. They may not be directly speech therapy apps-but I have seen note taking apps and others. Also-what accessories would you recommend that I could use in therapy. The sky is the limit. I might not use everything-but it is good to know what is out there. Any other information you can give me would be appreciated. First of all, thanks for giving me permission to post your e-mail openly on my GeekSLP.com . Your e-mail contains questions I often receive from other “followers” and I thought the answers I give you could help other SLPs when making a choice on which iPad to purchase, apps, accessories, etc. You are on the right track for making sure you include apps, and accessories on your budget. 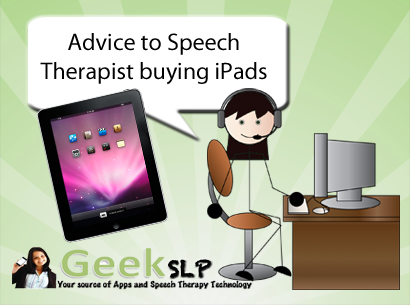 Many people purchase the iPad and forget that mostly likely when dealing with speech therapy apps, and accessories you may end up spending as much or more what you spent on the iPad itself. 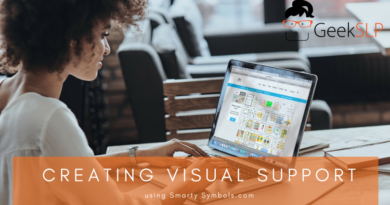 It is very important that you consider which apps to buy and include in any grants or budgets for school districts. To answer your first question: The apps. I have compiled a list that I have been updating monthly with apps in several areas of interest for speech-language pathologists. The list is not a complete list, given the fact that a lot of apps are released daily; but it is a start. Also, they include apps that I tried myself and believe to be good quality apps. Now to accessories: I would highly recommend that you plan on purchasing a case for your iPad if you are going to use it for therapy. Now, if you want to consider other accessories. 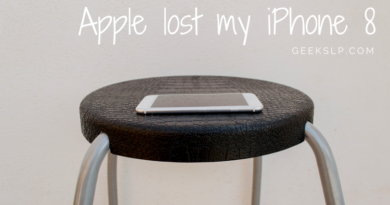 I would also recommend you purchase a stand ( view my post on iPad stands), and speakers. These are the other essential accessories for iPad for therapy. On to iPad Memory size: This is a very common question I get. Most people believe that they need the biggest size memory for the iDevices. Instead of answering this question, I would like to give you an idea of size and numbers so you can make that decision for yourself. I have three different iPads ( one 64G and two 16G). I own over 350 apps on my iTunes account on my computer. My 64Gb iPad has 203 apps on it, and I only used 15Gb. Not all 15Gb are used with apps. Most of it in fact is used with photos, videos and music. The average size of an app is 64Mb ( there are apps bigger and smaller than that); but to give you an idea 1GB is equal to 1000Mb; you can have 15 apps to use 1Gb of your iPad. Now it all depends on how many apps you plan on having, plus if you plan on having music and videos on it too. From what I have observed, I see that many people download apps and tend to delete many of them after a while. In the end you would always renew your apps. I hope I was helpful on your decision making process. I am writing a grant for an iPad and apps. Do you have any sample grant applications or suggestions for the grant application? I do not have any sample or tips yet. But I will research about it and post it here as soon as possible!